Hartt Wixton wrote an article about his experience deep trolling with Captain Steve Davis at Otter Creek and we thought our followers would enjoy his honest review of Flashy Fish Lures. “With all the fishing I’ve done over the years, there is one area of limited experience: deep trolling. In fact, when fishing Canada’s Great Slave Lake six times I deliberately did most of my angling by casting. I caught plenty of lake trout along with all the others. But admittedly, deep trollers caught the larger fish. Still, I was happy to use what I felt were greater skills in casting rather than merely dragging a spinner behind a boat. Yet, as was obvious recently in fishing Otter Creek Reservoir, sometimes deep trolling with down riggers is the only way to entice any fish. That was proven when my rod with a few bell sinkers fetched nothing in 2 1/2 hours while boat skipper Steve Davis of Ivins, was owner of two bouncing rod tips. When switching to down riggers (a 4-pound ball attached to the line and detached via a sharp jerk when a fish hits) I tallied four to five rainbow trout. So did another angler aboard, Roger Anderson of Ivins. To make things even better, we used Steve’s string of wonder lures (Davis makes his own) and especially one tabbed “Lunker Lure.” These are light weight (translated: major wobbling action) lures he designs and makes himself. But the main thing is getting your offering down where the fish are feeding; in hot weather it means getting near bottom, in this case 20 to 25 feet. Precise depth is from a finely-tuned fish finder. Otter Creek is a wonderful trout fishery. We landed and released at least 40 fish this late June day. Yet I talked with one couple who fished the same day who said they caught … exactly nothing. Didn’t find the feeding zone. It is usually controlled by water temperature. The hotter the weather, the deeper the feeding zone. Different species have their own comfort level. Lake and brook trout, true chars, prefer temps in the 40s and 50s while the other trout are more tolerant. Otter Creek has so many fish there is a danger (with correct tactics) of keeping more than a limit. And here is a problem. 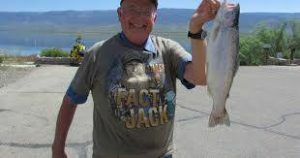 The 2015 Fishing Guide Book says on page 18, “You may possess two daily limits of fish as you travel within Utah … if you are on an overnight or multi-day fishing trip (except Strawberry or Flaming Gorge Reservoir). Then it adds, “You may continue to fish while in possession of a full daily limit (general rules meaning four trout), but you must immediately release any additional fish you catch.” Say what? But I digress. Catching that bunch of big fish was fun. But it was on the way home when I felt challenged with my angling skills. The Sevier River in Circleville Canyon was lower and cleaner (finally fishable) than I had ever seen it so I decided to meet the challenge. I found a deep riffle and stalked any fish that might be feeding there. My No. 3 Mepps spinner was dropped at the head of the flow and retrieved downstream to simulate a wounded minnow. First cast. A sting of the hook, a 15-inch rainbow leaped for freedom. I landed that one and on the next cast in the same riffle hooked a 17- to 18-incher, which threw the hook. Did this require more skill on my part than merely watching for a bouncing rod tip in back of a boat? I submit that it did. Skill is required, of course, by the boat skipper who reads the fish finder and sets the weights. But the “guests” need do little work. For me, the purpose of being out there is not just hauling in fish but personally outwitting them. I might add that this outing to Otter Creek Reservoir was made all the more enticing by sleeping under a thousand (or more) stars, albeit on a hard deck floor. As hot as the day was, in the 90s on shore, being on the water had a leavening effect and once the sun went down, things got downright chilly. Dozens of other campers could be seen along the bank, albeit mostly in RVs. Otter Creek is a very popular place to be, so much so that if you are going, best avoid weekends. What lure? If after big fish, you don’t necessarily have to use a large lure. The “Lunker Lure” mentioned earlier is about size of your thumb. Most minnows providing fare for even large trout are about that size. If there is a general rule to successful fishing, it is that you offer the predator prey it is accustomed to eating. Same holds true in fly fishing. Bass, walleye or other, give them what is most abundant in their given habitat. Cost to park inside the state park is $3 for the day, $10 overnight. Call ahead to determine cost inside the campground. A private campground can also be found across the street with a café and basic fishing tackle. All of this is near East Fork of the Sevier River, normally a productive trout stream but not in June with spring runoff and return water from irrigation flows.